1658 January 1. Daniel Trezevant was born in Authon-en-Perche, Beauce, France, and was baptized on March 20, 1658. He was a son of Theodore Trezevant (1640- ) and Susanne Menou (1640- ), who had married there on December 5, 1655. 1679 February 5. At age twenty-one he married Susanne Maulard ( - ), born in Chanceville, Beause, France, a daughter of Lubin Maulard ( - ) and Gabrielle Berou ( - ). They were married at the Protestant temple of Fontaine-sous-Premont in Ouerre. Antoine Poitevin, the step-father of the bride and head of the family, witnessed the marriage. 1680 Their son Mathieu was born in Mainthenon, Beauce, France, his baptism on May 30 witnessed by Antoine Poitevin. Daniel possibly did his apprenticeship as a weaver in Menthenon. The Poitevin and Trezevant families would stay together as they fled to England and then sailed for South Carolina. 1682 Daniel Trezevant Jr. was born in Maintenon, Beauce, France. He died in the province of South Carolina in 1706. A daughter Susanna Trezevant was also born there. She married Cornelius Pranpain in 1707 and died in South Carolina. 1684 December. Daniel Trezevant, a member of the French Church (Huguenot), was admitted as a foreign journeyman and paid dues to the Weavers Company of London. 1686 October 15. Daniel signed his oath of allegiance to King James II of England. 1686-1692 The couple had four more children: Isaac (1686- ), Theodore (1688-1732), Marianne/Marian (1690-1767), and Magdalene/Madalene (1692-1768). 1695 The couple’s names appeared on the Liste des Francois et Suisses, compiled 1694-1695 for the Santee and Orange Quarter. 1697 March 10. The couple’s names appeared as registered for the English Naturalization Act. 1706 Their son Daniel Jr., a weaver, died at age 28. Grace, Charlet Poitevint. Email correspondence with author. 2015. Grace, Charlet Poitevint. The Huguenot Family of Poitevin: From France to the Province of Carolina. Transactions of the Huguenot Society of South Carolina, No. 120, 2017, pp. 1-34. Huguenot Society of London. Notes on the Huguenot name of Trezevant. London, England: March 25, 1973. Kenan, Robert Gignilliat. 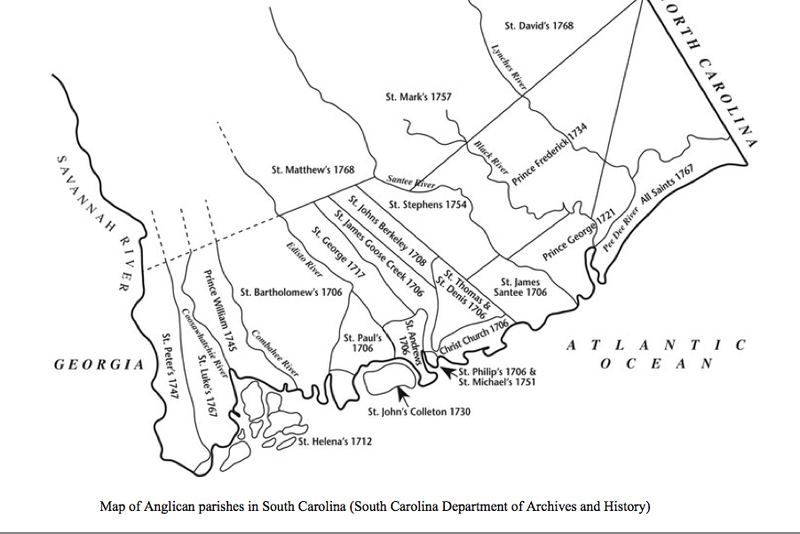 History of the Gignilliat Family of Switzerland and South Carolina. Easley, SC: Southern Historical Press, 1977: pp. 266-268. Trezevant, John Timothee. The Trezevant Family in the United States. Charleston, SC: The State Company, 1914: pp. 11-13, 49-50 (his will). Excellent research; the best I have ever seen. The information is presented in a clear, precise, scholarly fashion. Daniel Trezevant’s will was probated in Jan 1726; his birth date can be estimated a few years after his parents’ marriage in Dec 1655; say 1657, unless there is a parish record to be found giving his exact birth date as 1660, the exact date is still not confirmed. Eglise Reformee Fontaine-sous-Premont parish record contains the marriage of Daniel Traizevant [Trezevant] & Susanne Moulard Feb 5, 1679. The Poitevins and the Trezevants were closely related. Susanne Maulard was the sister of Pierre and Anthoine Poitevin; albeit, half-sister technically, but kinship shows in deeds as close til death. Daniel and Susanne Trezevant’s daughter, Susanne Trezevant(Peter Poitevint’s niece)was given a gift of 92 acres adjoining her parents and Peter Poitevint’s land after her marriage to Cornelius Pranpain. It reverted to back to the family after both she and her husband died before 1707. This is recorded in Langley, Vol. III, deed of 1755. Thank you for posting this informative and comprehensive family tree online.